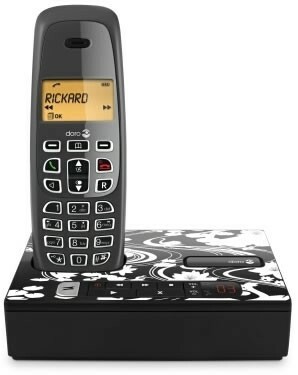 The Doro Neobio 25r DECT telephone has a base station that can be customized with different designs. When purchased the Doro Neobio 25r cordless telephone includes two different designer skins to choose between, also you can choose to leave the base station plain in its original form. 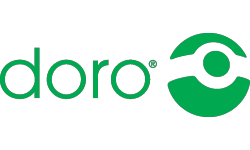 The Doro Neobio 20 is suitable for in the office or in the home and can connect into a standard analogue telephone line, or into a telephone system on an analogue extension. If you want to talk handsfree you can as the Doro Neobio 25r cordless telephone even has a handsfree speaker on it. Also if you want to be able to talk handsfree on the move then there is even a headset socket on the Neobio 25r to plug in a handsfree headset. Built into the Doro Neobio 25r cordless telephone is a digital answering machine with a recording time of 30 minutes. Using this answering machine is easy as the all the control buttons are clearly marked on the base station of the Doro Neobio 25r cordless phone. Also as the answering machine is digital the call recording clarity is very clear and playback is instant at the press of a button.